I decide to visit the museum while on a travel assignment in Hood River, more as an afterthought than from deliberate planning. After all, what sort of aircraft and vehicle museum could a small town (pop. 7,000) known primarily as the windsurfing capital of the U.S.A. have to offer? Perhaps a couple of old derelict biplanes and a handful of dusty early model cars? Reluctantly, I drive to the museum and park outside, with no idea of what I’ll find. I politely listen, of course, just wanting to go inside the museum, take a few photos, then be on my way. I can’t see the vehicles and aircraft because they’re along a narrow hallway and through some doors. Finally, we walk through to the main gallery. I come to a dead stop, astonished at the sight before me. It’s enough to bring an aviation and vehicle aficionado to his knees. Row upon row of 68 historic prop aircraft in mint flying condition, long lines of gleaming, polished classic civilian vehicles (101 in all), and 12 military jeeps, all stretching to the back of a huge, 90,000 square-foot hall. Opening in September 2007, the museum has quickly gained international recognition for having the world’s largest antique prop aircraft collection. “We’ve had a number of enquiries from the Smithsonian about some of our aircraft”, Terry Brandt tells me. “But so far we haven’t been interested because we want to keep all our aircraft under one roof”. Wandering through the museum, I see a number of glass cases containing displays of military and aviation memorabilia ranging from World War II Nazi feldgendarmerie gorget, SS daggers, weapons, ammunition, helmets, medals, aircraft engines, propellers, cockpit instruments, military vehicles, plus a sizeable research and restoration library. But it’s the military jeeps I’m most interested in. The museum’s superb collection of fully restored and operational military jeeps from WWII and the Korean War participates in Veteran's Day, Memorial Day, and 4th of July parades throughout Oregon and Washington. Designed as a workhorse all terrain reconnaissance vehicle to replace the cavalry horse, the humble jeep exceeded all expectations. Today it’s still the most popular motor vehicle in the world. The jeep’s history dates back to the late 1930s when the U.S. Army needed a small versatile 4-wheel drive utility vehicle for different terrains, and light enough to qualify as a 1/4-ton carrier. Designated as a GP (General-Purpose) vehicle, it soon became known simply as the ‘jeep’. The military jeep has hauled millions of tons of supplies and ammunition to the battlefront, towed heavy equipment, and pushed stalled vehicles aside. It’s served as a reconnaissance vehicle, a mobile communications center, forward observation post to direct air strikes, a gun platform for large bore rifles and machineguns, and led bomber aircraft to and from their hardstands. 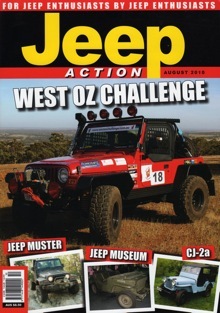 The jeep’s less conventional uses include being flown into battle in gliders or parachuted into combat, driven along railways in World War II when roads were impassible, serving as a locomotive to pull flatcars, used as an altar for mass by military priests, acted as a snowplow, and laid telephone wire—and I’m sure there are war veterans out there who could tell me dozens of other ways they used jeeps. David Stirling’s Special Air Services (SAS) raiders in the North African desert war used military jeeps extensively. This band of rugged desert commandos wreaked havoc far behind enemy lines, destroying over 250 German aircraft, dozens of supply dumps, and untold enemy vehicles. None of this would have been possible without the ubiquitous jeep that handled the desert sand dunes admirably. With all these applications, it’s no wonder that two U.S. presidents (Roosevelt and Eisenhower) deemed the jeep as the most valuable weapon and most important contribution of World War II. In 1940 the United States Army tested models provided by Bantam, Ford, and Willys –Overland Company of Toledo, Ohio. Bantam’s Karl Probst, designed the jeep in less than 5 days! If he only knew the impact his jeep would have in the following decades. Willys was awarded the final contract, incorporating features of the other jeep designs submitted by Ford and Bantam, and built 18,600 jeeps in 1941. Soon after, Ford started mass production of the GP-W, a General-Purpose jeep, made under license from Willys. After the testing, the 1500 Willys test models were given to the Soviet Union under the lend-lease agreement, and the Ford and Bantam GP test models were sent to Great Britain. Modifications were continually made to the jeep, and by 1945 a staggering 487,000 jeeps had been produced between the two companies (Willys-Overland 259,849, and Ford, 227,314). By the end of World War II, Willys was cranking out three jeeps every four minutes, 24/7, at its Toledo plant in Ohio. By comparison the Germans only manufactured 52,000 VW Kubels, their poor man’s equivalent of the jeep. Captured models of the German VW Kubelwagen, incidentally, were tested alongside the jeep at the Aberdeen Proving Ground in Maryland, and found seriously wanting. The beauty of the jeep was its simplicity. It had a starter, horn, light switch, choke, ignition, hand throttle, gas gauge, speedometer, temperature gauge, hand brake, gearshift, accelerator, and oil gauge. The jeep became the sentimental and favorite vehicle of the G.I, and many an enlisted soldiers lost a stripe for ‘borrowing’ jeeps. By the end of the war the jeep had proven its worth and was here to stay. The WAAAM’s military jeep collection (8 in all) reflects the history and evolution of the jeep from 1942 through 1966. It boasts three World War II classics: a1942 M100 Bantam (with a T3 utility/combat ¼-ton trailer), a 1943 Ford GPW with a mounted 50 calibre Browning machinegun, and a 1945 Willys MB jeep. Brian Brandt tells me the story behind the 1943 GPW. “We found this jeep in Yuba City, California, in very poor condition. Not running, dented all over and rusty. I tore this jeep completely down to frame, rebuilt third members, drivelines, transmission and transfer case, and engine. Hundreds of hours of body work to fix the rusted and dented body. I didn’t have to find many parts as it was complete when I found it. The 50 calibre Browning I built from real parts”. About the 1943 T3 trailer, Brian says, “We found this at a military show in the California Bay area. It was perfect. Complete original, no dents with combat wheels and original World War II tyres. All I had to do was paint it”. In 1950, as the U.S. Army geared up for the Korean War, a new Willys jeep design emerged in the M38 ¼-ton, 4 x 4 tactical truck. Sixty thousand M38 Jeeps were ordered and saw sterling service in that conflagration, while thousands of older model jeeps were also reconditioned for Korea. The WAAAM’s 1952 M38A1 Willys Jeep has the original “round fender” design, which makes it easily recognizable. The museum’s two other M38s have some interesting armaments. Its 1952 M38 is upgraded for military use, with a flat fender, a one-piece windshield, protruding headlights, and a 30-calibre Browning machinegun mounted on a thick metal tube just behind and between the front driver’s and passenger seats. It must have been deafening for the driver when the gun was fired, with hot shell casings spitting out everywhere. Brian Brandt found this model in Idaho. “This was donated to the museum by Warren Bean. It was complete, clean and just needed some engine work and paint”. The museum’s third M38A1C, a 1953 model, is mounted with a rather nasty looking 106mm recoilless rifle that runs the whole length of the jeep, protruding through a hole in the windshield and out over the hood. A spotting rifle is mounted just above the main barrel. Firing the spotting rifle helped confirm that the main gun would hit the target, especially at night when it was unclear whether the 106mm was on target. If the small bore rifle hit the target with a “clang”, the main gun was engaged immediately. The M38 was eventually phased out in the 1970’s after 101,000 were produced. It was replaced by the Ford M151 “Mutt” which had many improvements including an independent coil spring suspension, an overhead valve engine, and was faster and more comfortable than its predecessor. The cushioning in earlier jeeps was never what soldiers would describe as comfortable, so the M151’s improved seating was most welcome. The only problem encountered with the M151 was due to its independent swing-axle rear suspension—with aggressive cornering it had drastic over steering and a tendency to flip over. The WAAAM’s M38 was found at a wilderness cabin in Canada. It had been used as a hunting jeep and was very beat up. “It took me one years to restore this jeep. It needed extensive body work and paint. The hard part was to find a 106mm rifle with the 50 calibre spotter, and all he brackets and parts for the 106 mounting”, Brian tells me. “After months of asking around, I found a guy with a cut up 106, and welded it all back together. Then I located a guy with a 50 spotting rifle. I had to locate the mounting parts to attach it to the 106. It took 8 years to find all the parts to complete the 106 mounting. The final part was the sight and box. Very hard to find. When I found them at a military show, the guy wanted $500 for it. I told him I thought that was too much, and he looked me in the eye and told me that he’d been going to these shows and this is the only one he’d ever seen. I could not argue and he got his $500”. The WAAAM’s 1955 M151 is armed with a M60 machinegun, mounted on a metal tube between the driver’s seat and front passenger seat. Movie scenes of soldiers standing up, firing these guns while the jeep rampaged over hill and dale are legendary, giving rise to the military version of the phrase “rock’n roll”. The museum’s 1958 M422A1 “Mighty Mite” tactical truck, produced by the American Motor Corporation, is quite a rarity. It’s high price tag ($5,200), difficulty obtaining spare parts, and cramped quarters resulted in only 4,000 being produced. Originally created for transport by helicopter in United States Marine Corps “vertical envelopment” operations, the Mighty Mite had a lightweight aluminium frame. However, by the time its kinks had been ironed out, the Marines had helicopters able to airlift the heavier M38 or M151. “We found this at a military show in Idaho, complete with bad motor. The engines on these have chrome plated cylinder bores and once they peel, they’re done. I had to bore them and install cast iron sleeves”, says Brian Brandt. Also of interest is the 1966 Willys M274 Mule, which saw service in the Vietnam War. This utility platform could be airlifted by helicopter or parachuted onto the battlefield, and loaded with up to ½ ton of supplies or equipment. When landed upside down, it was simply turned over and put back into use. The driver’s seat could be removed and the steering column moved to accommodate more equipment. This platform was extremely versatile and used as a boat for river crossings and as a weapons platform for recoilless rifles or TOW missiles. The WAAAM’s Mule was purchased in Canada from a friend of Terry Brandt’s. The WAAAM’s other military equipment includes a 1943 World War II Sperry 60" anti-aircraft spotlight and generator, a 1949 M100 Utility/Combat Trailer, and a 1952 Kapple M00 1/4 –ton trailer. Brian Brandt tells me has enough restoration work waiting for him to keep him busy for several years. He’s got a 1942 Ford Dodge truck, two 1942 Ford GTB 1 ½-ton “Burma” jeeps, a 1942 Ford GPW jeep, and a 1954 Dodge M37 3/4 –ton Military cargo truck, all waiting patiently for his restoration magic. Clearly, the WAAAM is well worth a lengthy visit, and not just for the militaria and aircraft. Its classic automobile collection must rate in the stratosphere with the Royal Automobile Museum collection in Brussel’s Parc du Cinquantennaire. Classic automobile enthusiasts will find themselves in Nirvana as they stroll past antiques like the 1914 Model T Ford, 1917 Stanley Steam Car, 1929 Packard Model 640 Super 8 Phaeton, 1931 Pierce Arrow Model 41, 1936 Cord Westchester Sedan, and the 1957 Studebaker Golden HAW 289 Paxton. And the Columbia Gorge provides some of the most diverse and scenic country you’ll ever see in the U.S.A.—green fir and cedar-lined banks merging into sparse tumbleweed covered, arid desert, with huge skewed ancient volcanic escarpments thrusting up for thousands of feet above. The WAAAM is just part of the great sightseeing in this area. Hours: Open 7 Days Week, 9 a.m. to 5 p.m., except for New Year’s Day, Thanksgiving and Christmas. Directions: WAAAM is located 3 miles south of I-84 in Hood River. From exit 62 take an immediate turn onto County Club. Turn left on Barrett and go through 4-way intersection, then head right onto Air Museum Rd.